I am going to attend a conference at tha National Maritime Museum next Feb 9th through 11th commemorating the centenary of the HMS Dreadnought. I wonder if I will see any of you there? 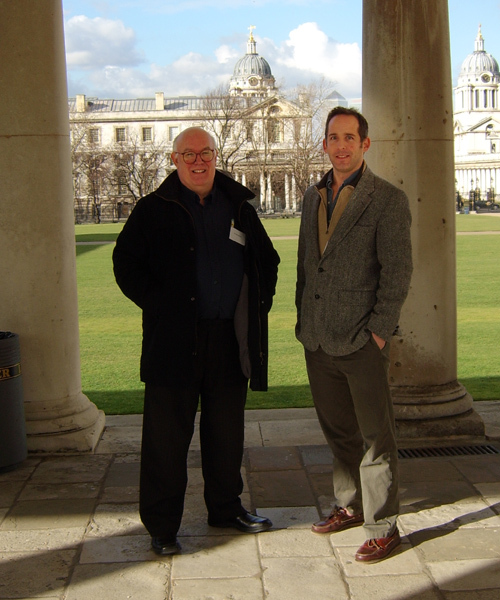 Speakers include Eric Grove, John Brooks (an expert on fire control systems on the RN of this era), and Andrew Lambert. Registration fee is 90 pounds. Please reply here if you're interested, and we'll try to ensure that we get hotel rooms convenient to dining out and maximum degrees of chat. Hmm, I think I'll definately be up for that. I happen to be a student so it's only �45 registration for me, which is nice and certainly worth it. I'll sort out the form and payment first thing tomorrow morning. This is the kind of stuff I had hoped to study at King's College in the War Studies Department under Andrew Lambert; alas, they fudged my application last year, and now I'm doomed to be a politician and not a strategic historian. I can not wait until February now. Will be great to meet you, Harley. Andrew Lambert is amongst those presenting. I'm a little sad to see John Roberts is not a speaker. He a phenomenal expert on the ship and her brethren. DK Brown would also have been nice, but I guess they want to make sure they get enough political context and not dwell too much on the bolts. And is it me or are the hotel rates around Greenwich enough to make a man choke? I hear they are formidable. I think I'd seek lodging somewhere cheaper and commute. The dockyard light rail system connects down there as I recall. I may seek cotspace at a friend's place or get a room in the extremely spartan hotels near Earl's Court. I'm all ticketed and will be there on the 9th through 11th, and then have 2 days (at least) to visit the National Archives and such. I believe Horsa (David Millichope) will be there, and perhaps Harley. I need to double-check that my registration is confirmed, as I have not heard back from NMM. Please take this chance to see if we can reach a better deal with NMM to get some drawings :D.
I've been booked in since the start of December :D. Will be there Friday thru Monday (gonna catch a concert). I will also be attending the conference. We had a great time at the conference. I met Andy303, Horsa, Harley, and RobB in addition to the usual pack of heavy hitters (John Brooks, John Roberts, Eric Grove, Andrew Lambert). Here are 3 shots David "Horsa" Millichope sent. The first day was merely a "hello" talk and then some wine guzzling at Queen's House. After the 2nd and 3rd days, however, we repaired to a local pub called The Spanish Galleon to talk and socialize. Below is after the 2nd day, and shows all the people familiar to the Dreadnought Project's BBS around the table, with the sad exception of Andy303. 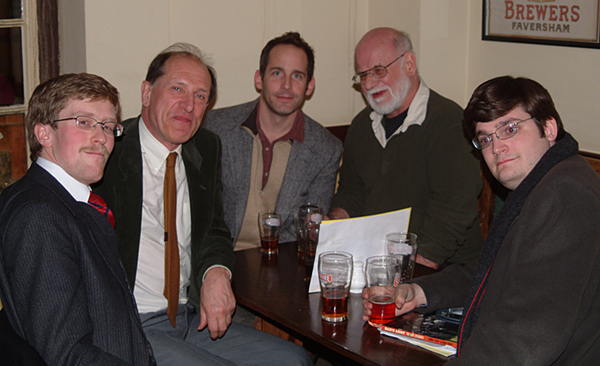 Let to right, they are Simon Harley, Rob Brassington, Tony Lovell, and David Millichope. After the last day, we prevailed upon Dr. John Brooks to join us, and found ourselves falling in with a larger assemblage of people studying in the UK. 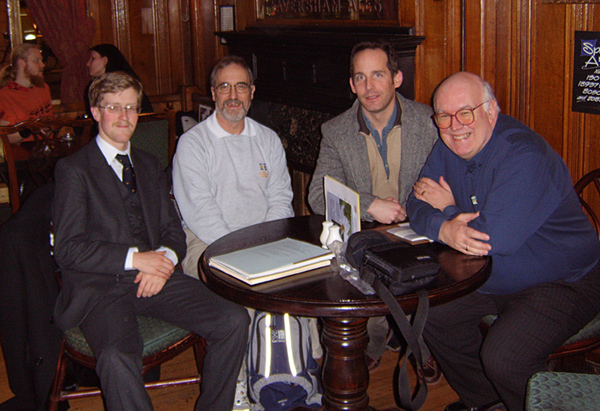 From left to right: Simon Harley, John Brooks, Tony Lovell, Russell Potts (a friend of John's who is working hard on an authoritative history of model yachting), and Chris Bukey (an American student of Eric Grove). It was a great time. My only regrets was that there was not more time for discussion, that there were not a stronger focus on the naval and technological aspects of the ship and her time, and that I missed my chance to see the great naval bookstore in Greenwich, which as weighed anchor and moved to a larger site further from the Museum. Looks like an interesting time was had at the Greenwich conference. Beer and dreadnought discussion, a fine combination! If anyone has time, is there any chance of a review of proceedings. There are usually some little gems of wisdom to be learned at such events. Beer and dreadnought discussion, a fine combination!